Drummer and composer Katie Patterson is bringing her band back to perform in Leeds, following on from their last Leeds appearance supporting the internationally renowned Snarky Puppy. This extra special gig features two special guests: tenor saxophonist Riley Stone-Lonergan and guitarist Alex Munk alongside Katie (drums), Pete Gavin (bass) and Oliver Cadman (keyboards). 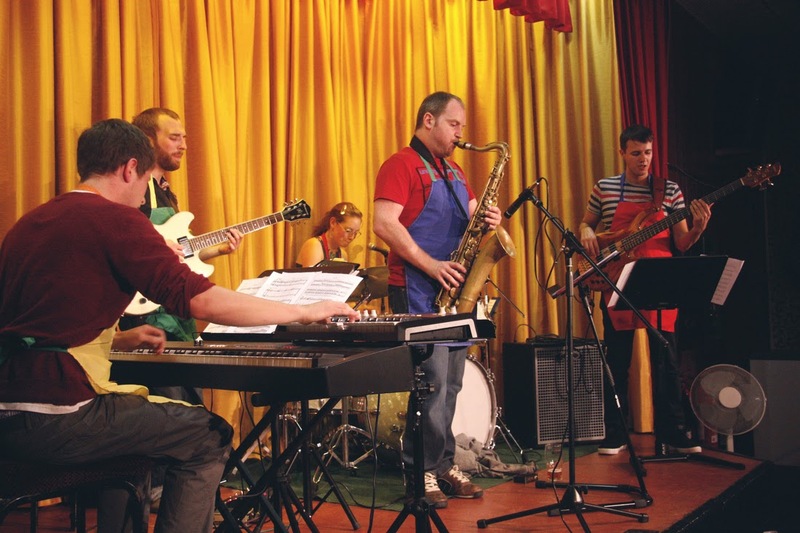 Both Riley and Alex are LCoM graduates who have built strong reputations as improvisers on the UK jazz scene. Riley won the Yamaha Jazz Scholar Award upon graduating and has performed at the Royal Albert Hall as part of the BBC Proms as well as being invited to feature as guest soloist at high profile performances in Italy. Most recently, Riley studied with Seamus Blake, Chris Cheek and Joel Frahm in NYC. Munk also won the Yamaha Jazz Scholar Award and went on to study postgrad at the Royal Academy of Music in London and now a highly regarded part of the London jazz scene, performing with a variety of groups and having performed with musicians like Kenny Wheeler and Stan Sulzmann. He is featured on Dave Hamblett's album Light at Night (Whirlwind Recordings). Canadian born drummer and composer Katie Patterson presents her band of infectious groovsters; unapologetically mashing up jazz with neo-prog and improv with an emphasis on a focused ensemble sound. "Wharf Chambers is a members' club and you need to be a member, or guest of a member, in order to attend. To join, please visit wharfchambers.org. Membership costs £1 and requires a minimum of 48 hours to take effect." Videos, reviews and information on the Allsorts Band can be found on the Allsorts Band website. Visit the facebook event page for information on how to enter the prize draw to win a special prize at the gig!